It’s over. No more local triathlon races this summer. 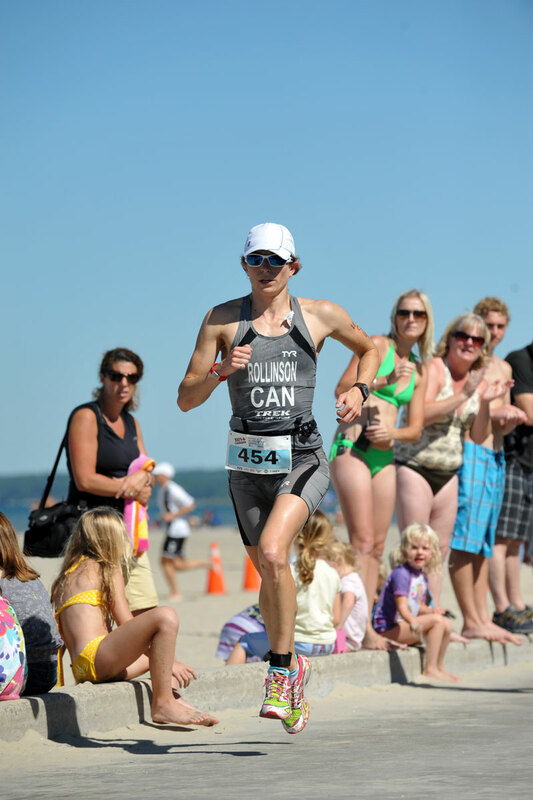 Mike and I finished up our last race this Saturday past at the Olympic distance race at Wasaga. If anyone raced this weekend, you know that it was THE most georgous weekend for busting a gut. It was a well organized race in a beautiful location and I would definitely do this race again. Mike and I headed up on Saturday AM for the 10:15 start time (10:15! LUXURY!). We planned on getting there at 9 to have lots-o time to warmup and get settled. After being stuck in traffic for an hour because of a truck fire, we got there with 15 minutes to spare. We both went into panic mode and didn’t even say good luck to each other before we ran off to our respective racks! I chose to put sunscreen on instead of putting my wetsuit on so that I didn’t get yelled at by the Sunscreen Stickler (ie Mike. He puts sunscreen on even during the worse snowstorms in Toronto). Needless to say my T1 was fast. Out on the bike the power and speed seemed to come really easily. I was amazing passing so many people (esp men!). I usually have to start in the first wave and so my usual experience is to get continually passed by all the fast male bikers. Last weekend I started in the fourth wave. It was so fun feeling like I was a fast biker (for once)! The course was absolutely beautiful and safe. Well, except for when athlete number 193 drove his bike off the road in front of me and almost crashed. He recovered, thankfully, and I beetled my way past him just in case he got distracted again! The run was hot and ….awesome. Who doesn’t love a little sand, boardwalk, trail, a two loop course with a HUGE amount of spectators near the finish/turnaround. My legs felt perfect coming off the bike, but my left shin bothered me a bit so I couldn’t open up the pace as much as I wanted to. This is DEFINITELY a race where you need to wear socks even though it is only 10km.